AICN HORROR Books: BottleImp checks out Luke Smitherd’s THE STONE MAN! AICN HORROR Books: BottleImp checks out Luke Smitherd’s THE STONE MAN and let’s us know where we can read it for FREE for a limited time! Greetings, all. Ambush Bug here with another AICN HORROR: ZOMBIES & SHARKS column. BottleImp sent me this review of THE STONE MAN and I meant to incorporate it into this week’s regular AICN HORROR column, but I forgot to do it, so here it is all by its lonesome. I have noticed a disappointing duet of trends lately in the books I’ve been reading in the genres of horror and science fiction. On the one hand, there have been the books where the author had an interesting and original idea, but the actual writing is unable to adequately express and expound upon the core of the story to unleash its wasted potential for the reader. On the other hand, I’ve gone through a few books which were decently written, but who cares? The plots are boring and hackneyed, the characters unoriginal, and the end result is forgettable, albeit couched in literate prose. But once in a while I stumble upon a book whose author possesses both an exciting concept and the literary chops to compellingly express his idea. That author is Luke Smitherd, and his book is THE STONE MAN. The plot is both remarkably straightforward and layered in mystery. In the English town of Coventry one summer afternoon, an eight-foot-tall stone figure suddenly appears in the town square. The figure is humanoid, but its head and body are featureless. As a large crowd gathers around the Stone Man, it inexplicably begins to walk. What begins as an exciting event for the gathered crowd—is it performance art, or maybe an incredibly hi-tech promotion of some sort?—quickly turns into terror as the people realize that the Stone Man doesn’t stop walking, even when it walks straight through a building. Attempts to stop it are useless; a few unfortunate people who touch the massive figure are instantly rendered unconscious. Despite police (and soon, military) efforts to slow or turn the walking statue from its path of unhurried, indifferent destruction, the Stone Man continues its pace towards… where? The bulk of the story is told to the reader by Andy Pointer, a minor journalist who is in Coventry and sees the first movements of the Stone Man. Through some unknown power—Andy postulates that the Stone Man is giving off some sort of signal that only certain individuals are aware of—he discovers that he is somehow “in tune” with the Stone Man, and realizes that he can “see” the figure’s destination. Andy speeds off to this destination, not for any noble reason (he tells the reader), but because the Stone Man story might mean that he finally has a story big enough to bring him into the big leagues of the journalistic world. Along he way Andy finds himself drawn towards a secondary destination, where he meets Paul Winters, another man who has the same (albeit slightly less strong) connection with the Stone Man. The two men head towards the Stone Man’s terminus point, not knowing what they’ll find… only that whatever is there is what the Stone Man came here for. With THE STONE MAN Smitherd is following in the famous footsteps of some of his fellow countrymen, at least in terms of the general plot. His story of ordinary people suddenly facing forces beyond their comprehension echoes British science fiction and horror classics such as James Herbert’s THE FOG and John Wyndham’s DAY OF THE TRIFFIDS or THE MIDWICH CUCKOOS, and we can even trace that lineage as far back as H.G. Wells’ seminal WAR OF THE WORLDS. Where THE STONE MAN differs from its forbears—and excels, in this reader’s opinion—is in the execution. Wells told his story of an alien invasion as a journalist would report the news, while Wyndham’s meticulous prose gives his tales an air of almost clinical, scientific detachment. Herbert, a more modern author, injects his writing with a sense of pulpy adventure and horror. Smitherd’s skill is that he is able to combine aspects of all three writing styles and combine them with a strength of his own: that of creating believable, three-dimensional characters. From Andy’s less-than-heroic avarice and ambition and Paul’s blunt, good-hearted intelligence, from the duo’s mix of confusion and determination to the steely resolve of British Army Brigadier Straub, Smitherd’s characters are never black-and-white, facile creations. Even the most minor players are given personalities and qualities that add depth to their actions, and therefore to the story as a whole. For a great example of Smitherd’s knack for writing fully-realized characters, let’s look at one of the book’s secondary cast members. After Andy’s initial encounter with the Stone Man, and after he discovers that the unstoppable juggernaut’s path of destruction included his apartment building, Andy runs into Shaun. An acquaintance more than a friend, Shaun (one of Andy’s flatmates’ buddies, he tells the reader) good-naturedly lets Andy crash on his couch for the night. Though Shaun (and his wife Laura) figure into the plot, one could argue that their characters are mainly there to provide Andy with a sounding board for his thoughts and theories about the Stone Man. They are essentially a plot device to allow the protagonist to puzzle aloud the possibilities about the Stone Man’s origin, its mission, and the reason for Andy’s special mental connection with it. And in the hands of a lesser writer, that’s all Shaun and Laura would be: a plot device, with about as much personality as a cardboard cutout. But Smitherd gives just as much care and nuance in crafting their personalities as he does his main characters; the reader never gets the sense that these two are anything less than fully-realized, three dimensional people, with their own stories, viewpoints and problems. It is this care that Smitherd takes in populating his novel with believable human beings rather than robots acting under the writer’s orders that gives THE STONE MAN its power. The reader becomes drawn into the story through the bond of empathy that Smitherd creates between the reader and these expertly crafted characters. I saw through Andy’s eyes as I became caught up in the adventure aspect of following the Stone Man as it strode unhurriedly across England. I became horrified along with Paul as the purpose—if not the origin—of the Stone Man was revealed. And I, too, was struck to the core as the import of all that was happening finally broke through Andy’s protective shell of journalistic ambition and reached his heart. It is the combination of the deceptively simple plot and the power of Smitherd’s characterization that makes this book as good as it is. THE STONE MAN is a novel that intrigues, enthralls, horrifies, thrills, and hits the reader with an emotional resonance as only the best stories can. Forget about the limiting parameters of science fiction and horror genres—any reader who loves a great story needs to read this book. 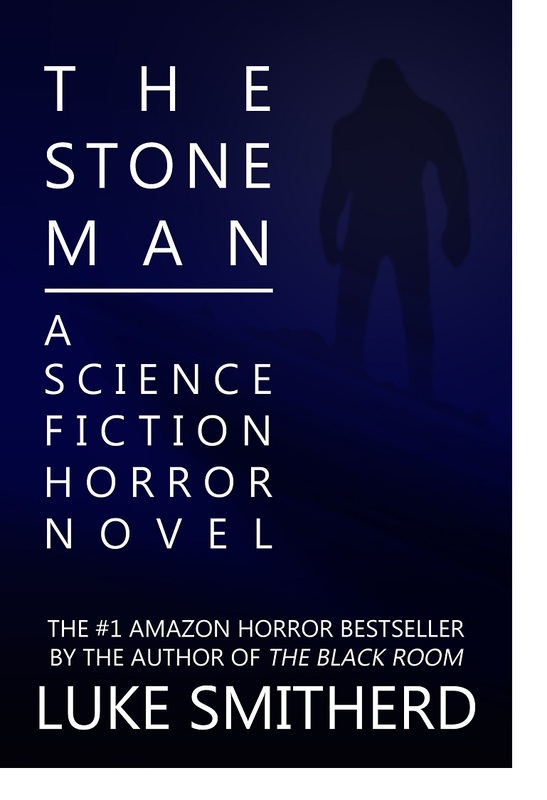 In fact, reading this book just became even more of a no-brainer, because from November 7th through November 11th THE STONE MAN will be available for your Kindle for free on Amazon.com. Check it out here! And for all you classicists that like the feel of paper and ink under your fingers rather than a tablet screen, THE STONE MAN is also available in paperback. Read it—you’ll love it!